Telecommunications giant, Globacom has announced world heavyweight boxing champion, Anthony Joshua as brand ambassador. The announcement took place at a media event at Eko Hotels, Lagos on Friday, February 1st, 2019. In attendance were top Globacom officials led by Bisi Koleoso, the Deputy Chief Operating Officer, Technical. Starring in the network’s motivational new commercial, the boxing icon in a message endorsed Globacom, as a brand that personifies the values he holds dear, such as tenacity, unequalled reach and speed. The company also unveiled a series of new innovative products to be launched in batches in the first quarter of 2019. 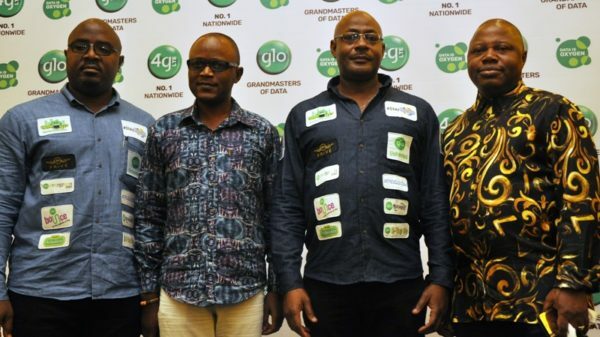 The products include the Glo Health Care App, Glo Mobile Money Agent Network, Glo Entertainment Portal, World Connect and Glo Artificial Intelligence platform, the first of it’s kind for any telco in Nigeria. Sanjib Roy, Group Chief Technical Director, Globacom, stated that the company is investing massively to increase its network capacity, coverage and quality of service, adding that part of the massive investment in new infrastructure is the technical upgrade of over 1200 of its cell sites. He also noted that new sites would be rolled out in rural areas to bridge the digital gap across the country. Outlining the company’s roadmap for 2019, Roy said “We plan to initiate new data analytic tools to capture subscribers’ experience in real time and also take pre-emptive actions to improve the network quality.’’ Roy also stated that Globacom has concluded the swap of its legacy facilities in Lagos, Ogun and Oyo states while the swap in Edo, Delta and other states in the South West is ongoing. “We are also upgrading the IN prepaid platform and investing in a new Call Centre platform, all in a bid to give customers the most pristine experience on the Glo network,” he said. He disclosed that Globacom is also enhancing the Network capacity for data and voice to give superior quality voice and boost download speed. The occasion attracted heavyweights in the media such as CEOs and Managing Directors of print, electronics and digital media.